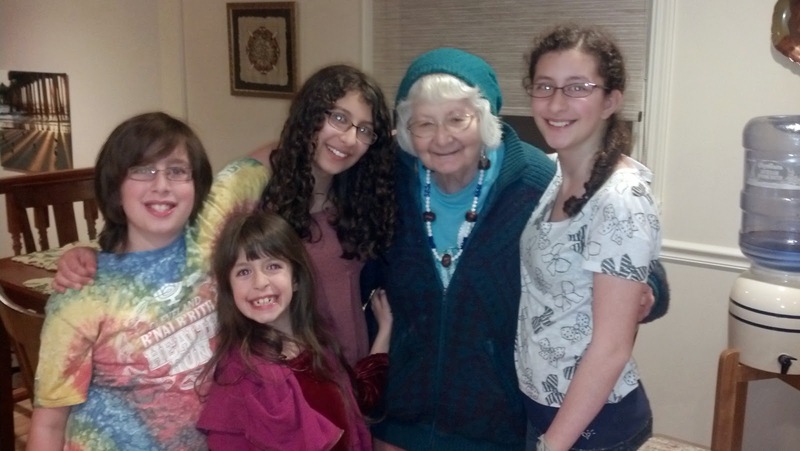 Last week, the family and I went to Cleveland to celebrate Passover with family. It was the first time I had been back since we moved to Maryland six months ago. In the weeks before the trip, I had had two nightmares about moving back to Cleveland - in the second one, Evan had told me we needed to move back for three months, and I had flatly refused, telling him to take the kids and let me stay here for the time he'd be there. That's how much I love living here in Maryland. When we were there in Cleveland last week, we went to see our Cleveland house. It's sold, by the way, finally, and we are scheduled to close the sale at the end of this week. So it's empty, and ready for a new person to have a life there. Even driving down the street was surreal for me. We lived in that house for fifteen years. We had all four kids while we lived there. My oldest is now in eighth grade. It was the only home my kids knew until six months ago. Walking in the door, walking around the house, I had two very distinct questions come into my mind, as if a deep confusion was going on under the surface. The first question was, "Is this a weird dream? Will I wake up in my bed in Maryland if I shake myself out of it?" The second question to surface was, "Have the past six months been a weird dream, and am I back home now?" I answered both questions, as if speaking to a frightened child, with reassuring answers about why I was there, and that we would be going back to Maryland soon, where we live now. But the uneasy feeling continued. Shortly afterward, we went back to my parents' house, where I had lived between breaks in college, and for four years after graduation, before getting married. It also, was my "home" for those years. This was the first time that my husband and I had spent the night there together as a married couple, and we've been married for seventeen years. When we lived in Cleveland, we all ate dinner as a family every Friday night, usually at my parents' house. Being back there, and especially sleeping there for a few nights, was another one of those confusing feelings for me, under the surface. I heard my inner voice, "Where is home? This was home. Am I home?" This poor, confused little me inside my head was really having a time of it. Again, I reassured this little voice with images of my new home in Maryland, and the date that we'd all be back there. Several times during the trip, I caught myself talking to the kids and using the phrase "we'll go back home" but referring to my parents' house, because that's where we were staying. But once I used it referring to the Cleveland house, and once I also used it to refer to our Maryland house. I felt odd each time. Yesterday, I flew from Connecticut to Baltimore, and then took a bus back to Gaithersburg, where I gratefully arrived back here, "Home" now. This is where I live. This is home. But my roots feel a little unsteady. It left me thinking about how long it takes, and what events need to happen, for the place you live to settle in deep enough that one can say the word "home" and it comfortably relates to the place that person resides. Most of all, I wonder how long it will take for me to be able to say "home" and have that deep, comfortable knowing where I mean. I want the word "home" to resonate as here in Gaithersburg. I LOVE our house here. (We're renting for now, though I hope to buy this house eventually if we have the opportunity). I love the area, the opportunities, the new friends and associates, all of it. It feels so much better to me energetically than the years we struggled in Ohio. I want this place to be the one that resonates when I say the word "home." Selling our house - being done with the closing and all - should help. Also, we still need to get MD driver's licenses and plates for our cars. That should help too, I think. I have a place to practice and teach Reiki. I have been teaching here, making contacts, and have some events lined up to go to for business networking and stuff like that. We have new doctors, eye doctors, dentist, and library cards. We have a new bank, and checks with our new address. Energetically, I really need to be here all the way. Home is where the heart is. "Be here now." This concept is a part of cultivating the full presence that helps in all energy work, and in mindfulness that is essential for being effective, confident, and balanced.